Alchemical symbols. 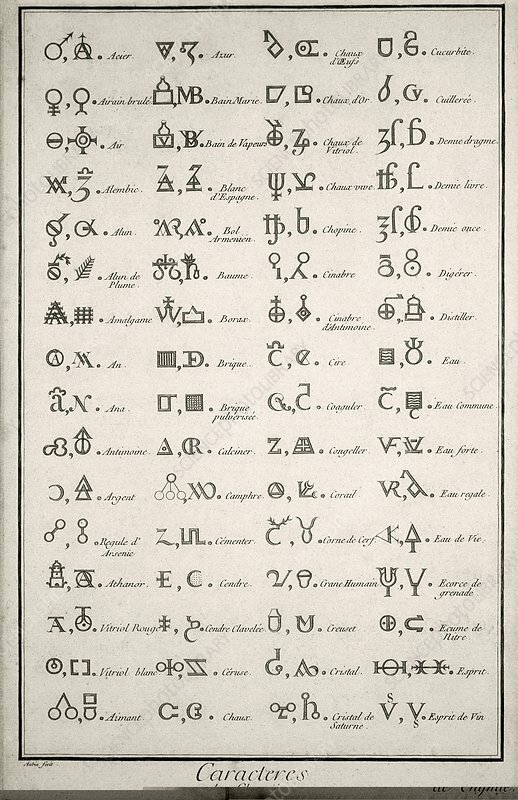 The alphabetical listing is in French and includes astrological symbols. Examples here include steel (acier), crystal (cristal), and silver (argent), the latter having the symbol for the Moon. Classical elements include air (air) and water (eau). Reagents include aqua fortis (eau fortis, nitric acid), aqua regia (eau regale, mix of acids) and aqua vitae (esprit de vin, ethanol). These symbols were replaced by modern chemical nomenclature, developed from the end of the 18th century onwards.